Just as predicted, President Xi Jinping is extending his power and abolishing term limits, become dictator for life. Mao’s official home is a museum. Well, it was until this week. Xi removed the sign and then moved right on in. He has officially become the next Mao Zedong. And although one fifth of the world’s population lives in communist China, no one can stop him. Massive censorship is taking place on the Internet by the Chinese now. Next on the hit parade is China’s relationship with the U.S. We are about to enter very dangerous waters with the Chinese. A shifted Cold War is now shaping up with us on one side with Israel and China, Russia, Iran and North Korea on the other. There are other players who will choose sides as the geopolitical chessboard settles out. There will be few surprises and plenty of betrayals in the end. There always are just before a world war. China will not sit still for President Trump trying to tame the dragon. They are beginning to make their move. A great deal of our manufacturing takes place in China, including power plant parts. Perhaps we should rectify that and soon as this heats up. Xi has ordered the Chinese military to counter the Pentagon with its own modernization in air, sea, space and cyber weapons, partly in response to Trump’s plans to revitalize American nuclear forces. That should not give us pause, it should push us to move faster. Did anyone really and truly believe that communist China would be open to free elections? Silly people. Xi will govern with an iron fist and pursue his agenda of making China a global power even if it risks putting Beijing in conflict with Washington and triggering a new Cold War after 40 years of mutual engagement. If fact, it’s already begun. America was foolish enough to put Chinese nationals in key positions in our government and scientific installations such as NASA. Not to mention our universities. China does not suffer from such idiocy in regards to national security. “In the Asia-Pacific, the dominant role of the United States in a political and military sense will have to be readjusted,” said Cui Liru, former president of the China Institutes of Contemporary International Relations, a think tank under the Ministry of State Security that often reflects official thinking. “It doesn’t mean U.S. interests must be sacrificed. But if the U.S. insists on a dominant role forever, that’s a problem.” By problem, he means it militarily. Asked if conflict was likely in the region, Cui said: “I don’t exclude that possibility. In this transitional period, it depends on how the two sides handle it.” He added that it was “not normal for China to be under U.S. dominance forever. You can’t justify dominance forever.” China plans on being THE world super power and they have plans for America. On her knees and subjugated that is. The Chinese view us as barbarians and we are tolerated as long as we benefit them. Xi appears to share the view of many Chinese analysts and military officials that the United States is a superpower in decline — and that China must step into the vacuum it leaves behind. Remember, they hold our debt and sooner than later, China will come to collect… violently. Xi has accelerated the military’s plans to build a blue-water navy, increased spending on weaponry in outer space and established China’s first military bases abroad. He has promoted a global infrastructure program to extend Beijing’s influence and ignored Western concerns about human rights, which have diminished under the Trump administration. They have massively expanded their nuclear arsenal as well and China is the premier threat in the world for cyber warfare. Because of America’s blind push for unfettered trade with China, they have prospered at our expense. 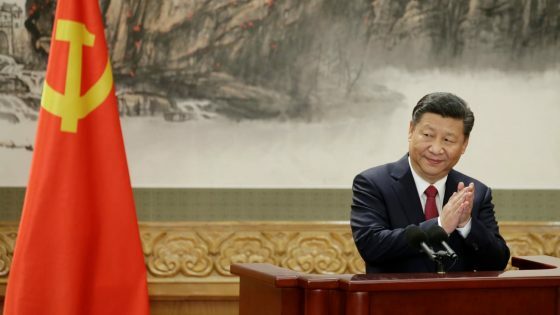 Xi’s emergence as a strongman has driven home the disappointment among American policymakers that China has not become more open and democratic as it has become more wealthy. At the same time, Beijing has rejected pleas for fairer terms of trade, angering both Democrats and Republicans. But I don’t see why they are surprised… any military or geopolitical analyst should have seen this coming long ago. 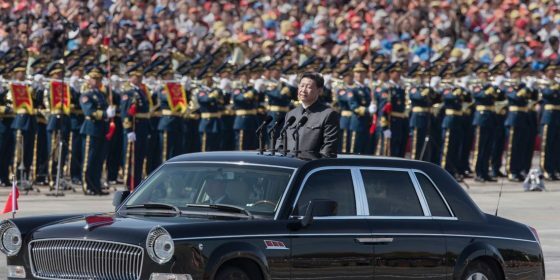 I find it extremely disconcerting and troubling that President Trump congratulated Xi on his “extraordinary elevation” in October and likened him to a “king.” The man is a dynastic tyrant… a massive totalitarian, communist dictator. Either Trump is naive in the extreme or he’s playing it close to his vest. Xi’s attitude toward China’s place in the world was echoed Tuesday in the state-run newspaper, Global Times, which proclaimed in an editorial that “the country must seize the day, must seize the hour. Our country must not be disturbed by the outside world or lose our confidence as the West grows increasingly vigilant toward China,” it said. That signals a frightening move by China to seize power across the globe. Most worrying for the United States, analysts say, is the strategic competition emerging in Asia, where China is seeking to challenge American military dominance that has been the status quo since World War II. China’s military objective is to break through the first chain of islands according to analysts, referring to the waters beyond Japan and Taiwan where the Chinese military wants to establish a presence. Chinese military experts have also emphasized the importance of dominating nuclear, space and cyber technologies, said Phillip C. Saunders, a China expert at the National Defense University in Washington. They are now an existential threat not only to the U.S., but to the world. Frankly, China could take out our satellites at any given time or cripple us with an EMP attack and we just sit smiling stupidly and nodding as they prepare to conquer us. The Trump administration announced this month a new nuclear policy calling for revitalization of the nation’s nuclear arsenal to counter Russia and to a lesser degree China — an approach that has upset Beijing. “Trump is obsessed with strategic forces,” Shi said. “He is determined to maintain American military predominance in face of China’s strategic buildup. That will make the relationship more profoundly confrontational.” It worries the Chinese a great deal, but thanks to Obama, we are far behind where we must be and soon militarily. The United States has also tried to build a stronger “Indo-Pacific” coalition with Australia, India and Japan as a counterweight to China’s rise. The four democracies would increase military cooperation and invest in infrastructure to compete with Chinese projects in the region. But Chinese analysts said that Beijing did not believe the effort would amount to much because the United States was unwilling to spend money on the projects. “In the short term,” Shi said, “China does not care about it because the ability to form a real coalition is limited.” Let’s hope for all our sakes, he is wrong.